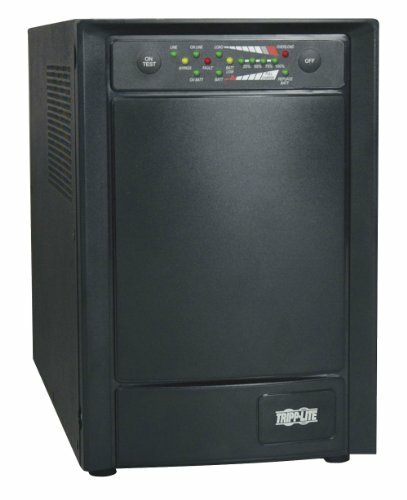 Tripp Lite's Smart Online SU1000XLa on-line, double conversion UPS protects critical server, networking or telecommunications equipment from blackouts, brownouts, voltage fluctuations and surges in an attractive all-black upright tower form factor. Large capacity 1kVA/800 watt UPS continuously converts incoming AC to DC, then back to perfect sine wave AC output at 120V AC (+/-2%). Removes harmonic distortion, fast electrical impulses, frequency fluctuations and other hard-to-solve power problems not addressed by other UPS systems. True sine wave output and zero transfer time offers guaranteed compatibility with all equipment types. Highly efficient operation in optional economy mode setting, saving BTU heat output and energy costs. Includes 6 UPS supported outlets. 2 single-outlet load banks can be independently controlled via a software interface to selectively reboot remote equipment, or automatically shed less critical loads to extend battery runtime for the most critical equipment. Extended runtime available with optional BP24V15RT2U, BP24V28-2U or BP24V70-3U external battery packs. Includes slot for internal network management cards, plus DB9 enhanced serial monitoring port for unattended shutdown, remote control and monitoring of UPS system and power data. Network management interfaces support simultaneous communications via USB port, DB9 serial port and slot for network management card options. HID-compliant USB interface enables integration with built-in power management and auto shutdown features of Windows and Mac OS X. Tripp Lite's PowerAlert UPS Power Management Software is available via free download. Compatible with Tripp Lite's Watchdog Service Monitoring/Rebooting Software.